2015 Domaine Philippe Tessier, Cour-Cheverny Blanc, La Porte Dorée, Loire Valley, France. 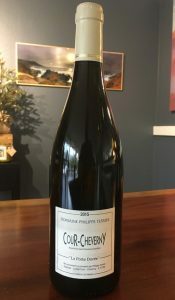 The Cour-Cheverny La Porte Doree by Tessier, a natural wines vigneron in the Loire, is an all organic 100% Romorantin cuvée, the rare and unique grape, a native varietal to Cour-Cheverny. Coming from Tessier’s oldest vines grown on limestone bedrock under soils composed of silica and clay, and is fermented using native yeasts then aged in older, neutral barrels for much longer than his entry level version of Cour-Cheverny Blanc as well as being allowed to through full malos. The elevage on this La Porte Doree lasts about 10 months in a combination of Foudres and Demi Muids, then rested a further 5 months in cement tank before bottling to add density and texture without taking away from the fresh character and terroir. Romorantin is a sibling of Chardonnay, and was once very widely grown in the Loire region, but it is now only seen in the Cour-Cheverny AOC, making it a rarity, it produces an intense wine, with a steely charm and has a driving mineral tone, somewhat reminiscent of Chablis, though more oxidative in style and in personality. Vibrant and mineral fresh to start with white peach and citrus, the 2015 La Porte Doree turns a touch nutty with pecan and hazelnut, baked apple and orange rind before regaining it’s vitality and more steely character adding wet river rock and lemon/lime with some leesy rounded mouth feel which gives a slightly creamy sensation to the medium weighted palate. This very natural and far from the mainstream wine is very worthy of your attention if looking for a path much less traveled, it grew on me in glass and I found myself admiring it’s complexity, best to drink the 2015 over the next 2 to 3 years, better yet now.